The Dallas Morning News staff have offered their predictions on the upcoming season. One prediction is "Wins needed to win AL West." I read this as the minimum number of wins; that is, if "wins needed" is 90, some other team in the division has finished with 89. If that's not the case, the prediction should have been titled "Wins by division winner." Rick Gosellin selected 97 wins (and Oakland as West champion). He also didn't select any AL West teams as wild cards. 1) Some AL West team other than Oakland will win 96 games and NOT be a wild card. 2) Both wild cards (from outside the West) MUST have more than 96 wins (barring ties), because they have to exceed the AL West's tough-luck 96-game winner. 3) At least one division winner from the Central or East, perhaps both, MUST have more than 97 wins (specifically, more than whatever the wild card teams have). So, Gosselin is predicting (unintentionally, I assume) that no fewer than five AL teams will win at least 96 games. That's a bold prediction. 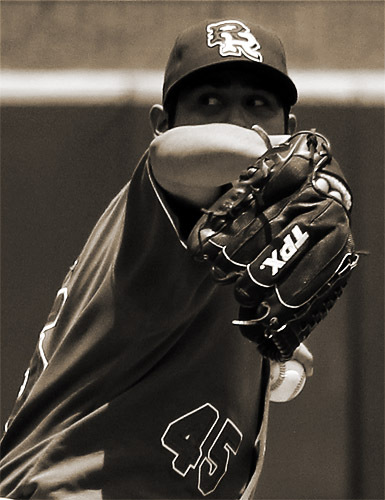 22-year-old Martin Perez is not only a fixture in the Texas rotation, he's arguably the lynchpin. With Derek Holland out for an extended stretch and Matt Harrison and Colby Lewis unlikely to contribute in early April, Texas needs Perez to provide quality innings immediately. Martin Perez looked like a man defeated yesterday. I've never seen him throw worse. In three exhaustingly prolonged innings, Perez allowed seven runs on eight hits, four walks and four strikeouts. He threw 85 pitches to record nine outs, including 41 in his final inning. For most of his outing, Perez had no functional fastball. The velocity was present -- he ranged anywhere from 89 to 95 in the 1st -- but it mostly existed in a binary state of missing badly or running over the heart of the plate. In later innings, he appeared to pull back slightly in order to throw more strikes, to little avail. He was also throwing across his body. By far, his best pitch was his changeup, and by my rough count he threw 25 of them including at least eight of 14 pitches in the second. Three of his four third strikes were on changes. As is often the case, he suffered more than his fair share of misfortune. Several hits wafted lazily over the infield, and the defense didn't provide all the support it could. He also committed his own error on an pickoff throw, but I'd pin that one firmly on 2B Yangervis Solarte, whose hesitation in covering the bag let Perez's throw reach the outfield. But, once again, he responded poorly. After a soft single by Fresno's Nick Noonan that plated two, Perez walked the next two batters. After his error, he immediately offered a pancake-flat changeup that Justin Christian ripped for a two-run single. Then, another walk. I always preach patience for the younger guys. Perez is the youngest pitcher in AAA. In fact, he's younger than every active starter in Texas's system except for Myrtle Beach's Cody Buckel and Hickory's Luke Jackson and Victor Payano. Development can be slow and fitful. For examples, you need look no farther than Matt Harrison and Derek Holland, two established MLB starters who still leave us scratching our heads sometimes. On the other hand, by the end of 2012, Perez will have logged three full seasons and close to 400 innings in the upper minors. I'm not worried now (well, not overly worried), but if he's pitching in early September like he is now, I certainly will be. The Rangers advanced Perez extremely rapidly because they felt he could make the adjustments and handle adversity. Lately, he's not, at all. This summer may be the most critical phase of his career. Fortunately, Perez recovered quickly, one-hitting Oklahoma City for seven innings (albeit with five walks) and tossing a 90-pitch complete game in consecutive June starts. Barely two months after the dismal May outing, he made his MLB debut.